Step 1 In a medium saucepan, heat the cream and orange zest over medium heat. Place the chocolate chips in a large mixing bowl. When the cream comes to a simmer, remove the pan from the heat and pour the hot cream over the chocolate chips, whisking until the chips dissolve. Whisk three-fourths cup granulated sugar into the mixture, then the milk, eggs, egg yolks, vanilla and almond extract to form a custard base. Step 2 Place the bread slices in a single layer in 2 greased 8-inch square baking dishes and pour over the custard; the bread may need to be squeezed into the dishes to fit. Cover the bread and refrigerate the mixture for several hours, preferably overnight. Step 3While the bread is soaking, make the streusel topping. In a medium bowl, sift together the flour with the remaining one-fourth cup granulated sugar and brown sugar, then stir in the sliced almonds. Using your fingers, mix the butter into the dry ingredients until the mixture is combined and resembles small peas (you may still have larger pieces of almonds; this is fine). Cover and refrigerate the mixture until needed, up to overnight. Step 4Heat the oven to 375 degrees. Remove the baking dish and streusel topping from the refrigerator to warm slightly as the oven heats. Step 5Take the drained cherries and toss them over the bread mixture, pressing a few cherries between the bread slices. 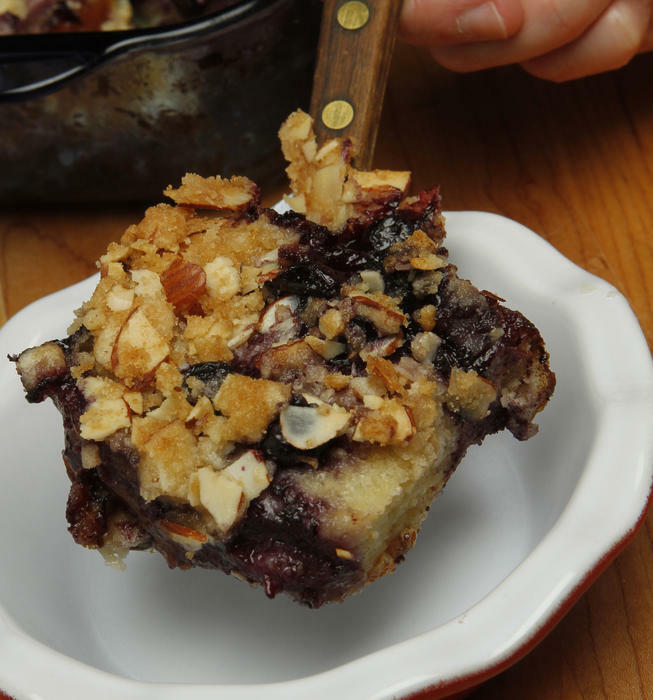 Drizzle the streusel topping over the bread and cherries. Step 6Bake the French toast until the bread is well-puffed and the topping is golden, about 45 minutes. Check to make sure the French toast is cooked throughout. Step 7Increase the heat to 425 degrees and continue to cook the French toast until the topping is crisp and golden-brown, about 5 minutes. Serve immediately. In Recipes-list.com we have selected the most viewed recipes from category - Breads Breakfasts . Enjoy the best recipes specially selected for you! Baked French toast is the right choice that will satisfy all your claims.